We ran the Katzbach scenario (August 26, 1813) at HAVOC on Saturday, March 28th. Despite the snow that started that morning and lasted all day and night (mostly melting as temps were just above freezing), turnout for the convention seemed good and we had the full slate of 8 players. Set up: Christian (Blue shirt) commands St. Priest's 8th Russian Corps and Tschaplitz's 3rd Russian Cavalry Corps. Richard (white shirt) has Yorck's powerful 1st Prussian Corps... although their roster is padded with a large portion of Landwehr! Another view of the Western part of the battlefield Paul (red shirt) is commanding Lauriston'sV Corps on the front line South of the Katzbach river, while Steve has Gerard's Corps behind that. Langeron's powerful Russian Left wing is some distance off to the East of Lauriston. Jean (?) makes the first moves with Langeron's wing. French opening moves by Steve (?) (Gerard/grey shirt), Greg (Sebastiani's Cavalry Corps/dark blue shirt with HAHGS logo), and Kevin (Souham/brown jacket). Both sides have some decisions to make at the start of the game; The Allies decide to bring most of Yorck's Prussians South across the Katzbach (which is still fordable in the Eastern portions) to support Langeron's attack. The Prussian Foot Artillery, though is sent to support St Priest... and also to try to establish a position enfilading Lauriston's defensive line. Keep your eye on the Russian Line unit with the light yellow flag, the Bieloserk regiment, as the battle unfolds. Tscaplitz's Cavalry, who were lacking maneuver room, attempted some charges upon Souham's intact defensive line after the rain stopped - they were blown to smithereens by the defensive fire of the French infantry and artillery. On he French side, Mc Donald has decided to dispatch Sebastianni's entire Cavalry Corps North across the river in a gigantic left hook. The rainy weather (although it cleared for several hours, before progressing to a Deluge for 2 hours) makes cavalry a bigger threat than usual in this scenario. Lauriston's Corps takes a while to reach engagement distance - in Snappy Nappy, musket range is only 1", and extreme range for all but 12 pounders is only 9", so advancing in Line is generally unnecessarily slow until you're 12" or less from the enemy. Middle stages of the battle - the lone Russian unit in no man's land just North of the Katzbach is our friends, the Bieloserk Infantry Regiment. It is there because it just defeated an attack by two French Line units, one each in column and one in Line. The Russians had been shot up by artillery fire (as had one of the French attackers), but still routed both of its attackers. In Snappy Nappy, if a unit routs an enemy unit in Melee, it regains a Morale level, so they went from "Nervous" to "Firm" as a result! Late arrival (and veteran of 2 previous Snappy nappy games) James (blue shirt) commands Sacken's 3rd Corps the Rusian reinforcements. James demonstrates why my own 6'4" frame is useful at times when playing miniature wargames! At the end of each tuirn, the GM rolls a D10; if the score is les than or equal to that of the turn just ended, Sacken arrives. So, what happens... at the end of turn 1, I rolled a 1! Bingo! Sacken arrives on Turn 2! James makes good use of road columns on the Primary road to get his troops up as quickly as possible. North of the Katzbach, the Prussian Artillery has deployed, and makes its presence known by destroying some of the opposing French guns. There's the Bieloserk Regiment again, facing a horde of French infantry - these are Provisional regiments, though - i.e., conscripts. Overview of the main battle lines;Sebastianni's cavalry is readying their "left hook". Hello, what's that we see over the roof top - the yellow flag of the Bieloserk boys! They have charged a French Provisional Light unit... and are about to Rout them , too - Morale level rises to "Bold"! Paul (Lauriston) works out some combats. He showed considerable talent at passing Morale Checks -0 a very, very useful ability in Snappy Nappy! The enormous weight of Allied forces against him has begun to tell, and Lauristron's artillery are pulling back to the defensive kine established by Gerard's supporting Corps. Meanwhile, the rain has returned, making fire of all kinds less effective. and this one shows the results of it's third Melee! St Priest, looking on attached to a Jager regiment, recommends to the Czar that they be promoted to a Grenadier Regiment in his post battle report! Sebastiani's cavalry announces its arrival by charging some "placeholder" Cossacks; outnumbered 2:1, and with the rains now pouring down in sheets ("deluge"), the result is in little doubt, and the horsemen of the steppes are quickly dispersed. The beneficiaries of a shift in Initiative, St Priest has drawn his sword and lead the Bielserk bois in a charge into some exposed French derrieres! Meanwhile, the (newly painted) Pomeranian Landwehr cavalry (white guidon with black "iron cross") "sees the Elephant" in the best possible light - charging into the flank of some French infantry themselves. Their target fails its attempt at forming Hasty Square, and with a +6 for cavalry hitting infantry in Line and another plus 9 for hitting a flank, even the Landwehr cavalry has little trouble in trampling the infantry under foot, the deluge penalty just adding further insult to the injury! Sebastianni's left hook lands hard during the second hour of Deluge conditions. The artillery's fire being notably degraded, his 2 Hussar and one Chevau-Leger Lancier units each charge a Russian battery - and sweep them away! Behind them, most of the arriving Prussian infantry has wisely formed Square! The next turn (turn 9) would have seen the deluge decrease to mere Rain once again, but all Terrain would then increase one level in difficulty, the Katzbach becoming everywhere impassable, open ground becoming difficult terrain, etc, thus slowing movement by 1/3. We had now reached the 6PM ending time. 8 turns in about 3.5 hours, not bad. the troop density was probably a bit too high (the very early arrival of Sacken aggravating that somewhat). a 6 foot wide table would have been better, but I might cut the number of units by about 1/3 if I ran it again. French: 31 Infantry units (186 figures), 10 Cavalry (40 figures), 16 Artillery units (why I'm not crazy about 1813 battles - too damn much artillery! ), 6 command, 283 total. Allies: 38 Infantry (228 figures), 13 cavalry (52 figures), 27 Artillery (97 figures), 8 Command, 379 total. Thanks to all the players, and especially Greg for helping me set up and take down the game, and James for assisting with take down and discussion of refinements for our big Snappy Nappy Waterloo "Campaign in a Day", to be played at the Portal in Manchester, CT, Sunday April 26th, 10 AM - 5 PM. As seen here recently, last month I renewed my Old Glory Army Card , and placed a large order of Napoleonic Prussians, intended to bolster my Prussian forces in preparation for running the battle of Ligny at Historicon in July. The first of those figures trot off the painting table now. This is the 1st Pomeranian Landwehr Cavalry regiment. It wears pretty much the regulation pattern Landwehr Cavalry uniform, but with the Litewka in grey instead of the usual dark blue. This variation was often seen in the Pomeranian Landwehr Infantry as well. I used Delta Ceramcoat "Hippo Grey" stained with Delta CC "Charcoal" for the Litewkas. I have previously covered the uniforms of the Landwehr Cavalry here as well. The shako should have a white Landwehr cross on the front, and a Prussian black within white cockade, but the Old Glory Dragoon figures I used for this regiment wear the usual Prussian covered shako - I did do one figure with the cross painted onto his shako cover, as seen above. The collars and cuffs are the provincial color, white for Pomerania (Pommern). I used full cuffs in white instead of just white piping on the cuffs. The trumpeter has red and white "wings" on his jacket, and the trumpet cords are white mixed with red. (The Cent Jours site belopw shows grey and white for the wings and trumpet cords). The stripe down the seam of the grey pants and the edging on the sheepskin saddles could be in the provincial color (white), or, as was common in the Prussian Line cavalry, red. The Cent-Jours site shows this unit still wearing grey coats in 1815, with the saddle edging in white. That seemed a bit too severe for my tastes, so I went with red, and for good measure threw in the red shoulder straps of the 2nd squadron. The Landwehr Cavalry were all equipped with a lance; these fellows have sensibly discarded their and pulled their swords instead. Like their infantry brethren, they were not supposed to carry flags or standards. I have given them one, though, based on en enlarged version of a variant lance pennon for Pomeranian units, a black Landwehr cross on white. Riding Dun horses (the trumpeter rides a white), I think they make quite an attractive unit. It remains to be seen how they will fight! With a total of 30 (!) Dragoon figures, even with adding 2 more units of Dragoons (appearing here shortly), I had six figures left over. I could have gotten 40 figures and made 5 units total, but that seemed like a bit much. Sop these spare figures were painted as Horse Artillerymen zu Pferde, and will be used to expand my Prussian Artillery arm. Here is the famous "shot in the face" figure once again! There seems to be one of these chaps in every OG Prussian "Cavalry Command" bag. Der Alte Dessauer; a German military march dating back to 1705. I saved the biggest and easily most powerful fleet of the Revolutionary and Napoleonic Wars for last - the British, of course. These are the ships of the naval heroes of fiction - Horatio Hornblower, Jack Aubrey, Richard Bolitho and the like, as well as the real life heroes of the Royal Navy - Nelson, Cochrane, Cockburn, Pellew, Jervis and many others. A pair of British brigs. 20 Gun Champion and the 16 gun Swift. and a pair of British Frigates. 44 gun Gladiator and the 38 gun Undaunted. Posts as captains of Frigates were highly sought after, as they offered more opportunity for independent action... and especially, prize money! 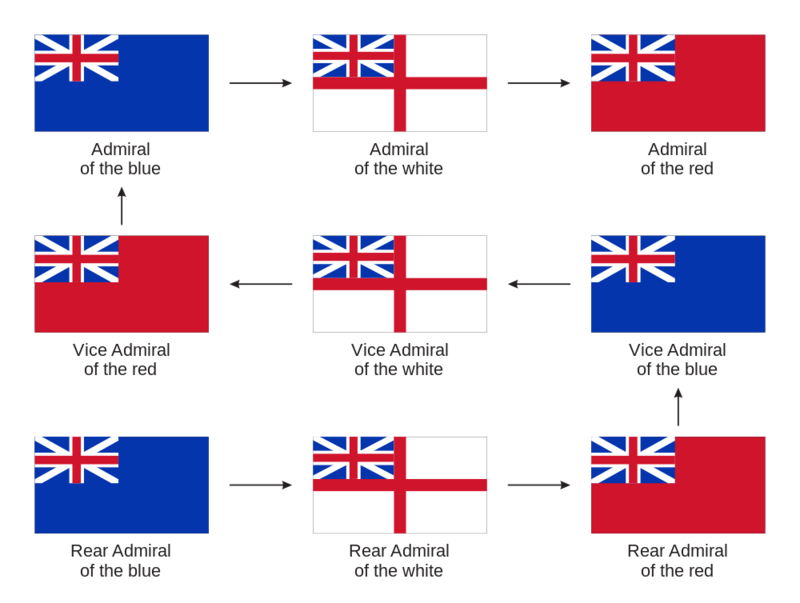 British Admirals were said to be "of the Blue, of the White, or of the Red"; the colors of the pennons flown by the ships under their command were taken from these "squadron" designations. Three more British Ships of the Line. The 74 gun Terrible, the 74 gun Zealous, and the 74 gun Audacious. Once a British naval officer attained the exalted rank of Post Captain, promotion to Admiral was strictly by seniority - merit played no role at all! If a Captain lived long enough, promotion to Admiral was virtually guaranteed. This lead to quite a surplus of Admirals in the fleet. However, the choice of which Admirals to employ and when was entirely up to the Admiralty; thus incompetent (or highly unpopular) Admirals might languish ashore on half pay for years. Three more British SOL; the lead ship is an immense triple decker. The 98 gun Formidable, the 74 gun Invincible, and the 74 gun Conqueror. My entire Fleet of 12 British Warships. Sailing in the column abreast, the fleet seems to be deployed according to "the Nelson Touch", prepared to break the line of the Frenchmen in the distance. Top down view of the whole Fleet. Finally, a shot of all four fleets, with some shoreline "terrain" pieces. I seriously want a costume like that :-)! Here are the first of the Landwehr figures that were part of my Lancashire Games order back in January. Since these were ordered specifically to beef up my Prussians for the 1815 events, I chose to paint them in the colors of some of the provinces that were added as Prussia retook territory it had lost as a result of the treaty of Tilsit. Although the 1814 regulations called fro the Landwehr to switch from the Litewka to the single breasted kollet jacket, it is likely that transition was slow and incomplete; hence my "new" Landwehr still wear the Litewka. I have covered the uniforms of the Landwehr infantry previously here. This unit is the 3rd Rhein Landwehr Regiment. The Rhein Landwehr was very late in forming, and didn't even make it to the front for the 1815 Hundred Days campaign... except in my army! The Provincial color for the Rhein units was "Madder Red", a natural dye that can vary quite a lot in hue. I chose to use a darkish red (Delta Ceramcoat [CC] Morocan Red). Because most reds don't cover well over Prussian blue, I undercoated the collars and cuffs with CC Adobe Red, a dusty red to dark pinkish color. Rhein units had brass buttons on their coats. Although regulation called for just provincial colored piping on the cuffs, examples of full cuffs in the facing color are known, and as I prefer more color, I have gone with that. These Lancashire figures have a great many minor variations, and as you can see, the Landwehr have all manner of encumbrances hanging off them as well! The "Magic Wash" has done a good job of picking out the details of the sculpting. This next unit is the 2nd Elbe Landwehr regiment,. once again using Lancashire Games figures. I used a different method for doing the flesh on these units than my usual; this time I painted the hands and faces first with CC Dark Flesh (I usually use a stain of CC Terrra Cotta), and then highlighted with CC Medium Flesh. I'm not sure which I prefer! The Elbe units had light blue facings and brass buttons. I used CC Bluejay foe the facings, as well as the hat band and trim on the schirmutze caps. The Landwehr cross on the front of the caps is well sculpted. Once again. plenty of equipment hanging off these fellows! Quite a number of the men in this units have lost their caps - or perhaps they have stowed them on a warm, late spring day in June, 1815?